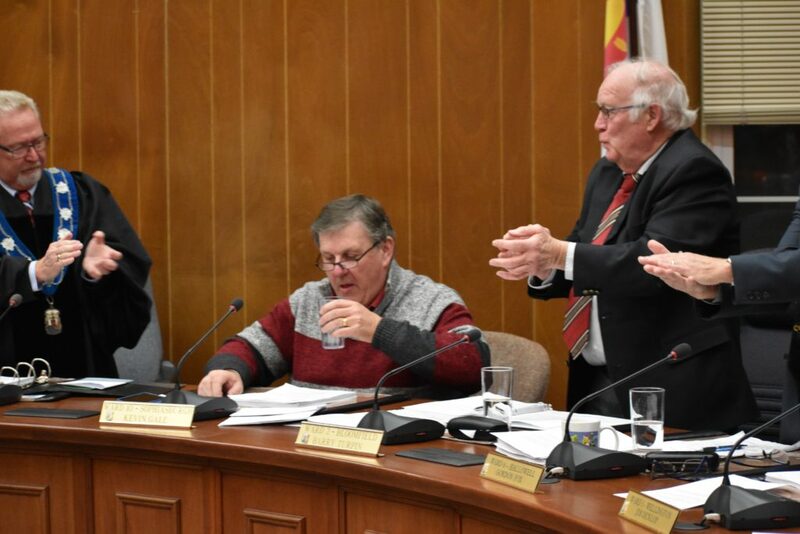 By incoming Prince Edward County Mayor Steve Ferguson’s count, County council will say goodbye to over a century of political experience that dates back to the days of amalgamation and before when the new council is sworn in next week. In their final meeting of the term, the current council paused at both the start and the conclusion of Monday night’s gathering at Shire Hall for a swan song for a number of long-in-the-tooth members of the horseshoe on Main Street. Next month, Prince Edward County Council will be without some larger than life figures in the forms of Sophiasburgh’s Kevin Gale and outgoing Mayor Robert Quaiff as well as a number of local political luminaries that are either retiring or departing from county political life for at least one term. Mayor Quaiff has served the community for 10.7 years and while that fraction of time just over the decade mark might seem odd to some, it’s highly significant in that it represents the time when Quaiff reentered municipal politics to fulfil a remaining term after the late councillor Ron Everall, a friend to so many in North Marysburgh, unexpectedly passed away. “That’s where that .7 came from and I didn’t want that .7 to happen, trust me, Quaiff said in his closing remarks. But that re-entry saw a renewed and reinvigorated Quaiff come back to the horseshoe with he determination and passion to make Prince Edward County a better place for everyone. And it would be hard to argue that any other Prince Edward County mayor worked as hard as Quaiff at raising the profile of this island and promoting it whole heartedly. From his position as chair of the Eastern Ontario Warden’s Caucus to the several regional committees he sat on to the Association of Municipalities of Ontario conferences and through both good times and bad, Robert Quaiff was all Prince Edward County, all the time during his term at the head of the horseshoe. Taking time to thank his family and the smiling staff that greeted him every morning as he walked through the front door, Quaiff called it an honour and a pleasure to serve the residents of Prince Edward County and to serve with this council. “At the end of the day when we go over the accomplishments from this term of council, I can say proudly that we did it together and I thank you for that,” Quaiff said. 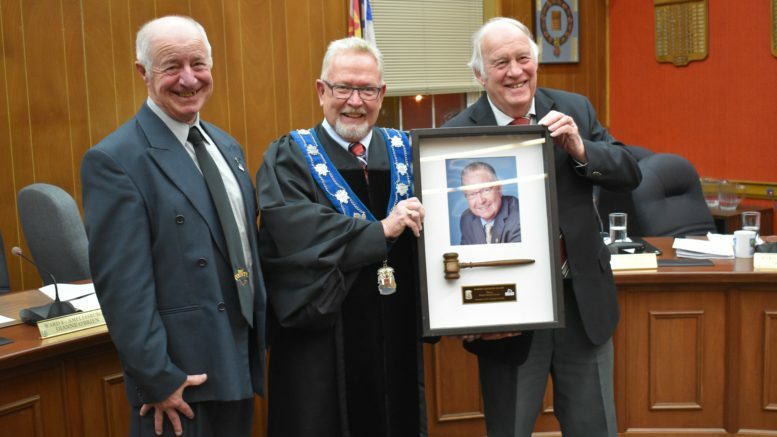 Gale dedicated his last meeting to the memory of his late father Graham Gale and was sitting in the same chair sat his father sat in as Councillor and Deputy Reeve on the final three terms of Sophiasburgh Township council just prior to amalgamation. Prince Edward County council in its current form had never been without Kevin Gale as a councillor as the Sophiasburgh real estate agent had been elected six straight times and been a member of the governance body for 21 years dating back to late 1997 before choosing not to run in 2018. Gale said those involved in municipal politics understand the sacrifices that must be made by family members and recalled time away for meetings, phones calls at all hours of the and night, confrontations by ratepayers and personal attacks through letters to the editor and nasty comments in the media. “My family stood by in those times and I’m truly thankful,” Gale said. Gale added he was also thankful for the confidence Sophiasburgh voters had in his abilities to elect him to six terms of County council. All told, Gale served under four mayors and 50 councillors and harkened back to some of past and current colleagues, calling people such as Keith MacDonald, George Vincent, Jim Taylor, Jim Dunlop, Laverne Bailey and Wayne Drake Prince Edward County political legends. In a special presentation on behalf of all of council at the start of the meeting, outgoing councillors Jim Dunlop and Barry Turpin presented Quaiff with framed gavel and picture. Both longtime and outgoing councillors spoke to Quaiff’s legacy of leadership and Prince Edward County promotion during the presentation. “In the last four years, you’ve provided great leadership and made a difference in Prince Edward County because now all of Ontario knows where Prince Edward County is,” Dunlop said with a chuckle. Turpin added that Quaiff’s leadership and friendship over the last four years was invaluable and the Prince Edward County Mayor was a great ambassador for the municipality. Dunlop started his municipal journey in 1993 and was the last Prince Edward County warden in 1997, serving the village of Wellington and ratepayers well during his time around the horseshoe even in times when ill health might have impinged a lessor candidate. Although reserved and quiet at times, Turpin was known as a councillor that could get much accomplished behind the scenes and away from the spectacle of public meetings. Among others saying goodbye to municipal life in an official capacity on Tuesday were councillors Gord Fox, Roy Pennell and David Harrison. Fox said he enjoyed every minute of representing Hallowell ratepayers for the combined decade he was a councillor for Ward six and felt the outgoing council put forth a really good “team effort” over the last years for the benefit of the municipality. Harrison, who’s contributed 13 years of his life to municipal politics dating back to the days of the township system said he enjoyed the luxury of overseeing a pre amalgamation and post amalgamation Prince Edward County. Harrison thanked his colleagues and municipal staff. Pennell also thanked those around the horseshoe, saying that as the term closed, he couldn’t think of a better group of people to work with. In his final comments as a councillor from South Marysburgh, Mayor-Elect Ferguson thanked all fellow councillors and Quaiff for their efforts over the last four years as well as their example in conducting themselves and business in the correct manner. Although not in attendance on Tuesday night, the meeting also served as the end of Councillor Dianne O’Brien’s time at Shire Hall. Elected a number of terms to represent voter’s voices in Ameliasburgh, O’Brien made an unsuccessful bid for Mayor in the 2018 municipal election.